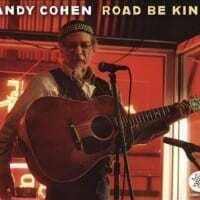 “Road Be Kind” reflects Andy’s life over many years on the road, folkin’ around with the blues. Cohen’s second CD for Earwig Records, Road Be Kind, finds the guitarist mixing 16 tunes of traditional and contemporary styles, with a few surprises thrown in. He opens with a humorous autobiographical track, “Five and Ten Cent Blues,” that he says is one of his oldest and favorite original songs. Cohen also includes a couple of story songs, Luke Baldwin’s “Seldom Seen Slim” and Walter Weems Doyle’s “Mysterious Mose,” and also a couple of tunes from a historical perspective, “The Goodnight Loving Trail” (a Utah Phillips tune about the old route from San Antonio to Cheyenne used to deliver meat to the army) and “Ten and Nine,” a song about an early 1900s Scottish women’s right activist. There are several pretty straight blues tunes as well, such as Sonny Terry’s “Spread the News Around,” and Sam McGhee’s “Seaboard Train.” The title track is a gentle folk tune penned by Scott Alarik, and songs like “More Wood” and especially “Talking Hard Blues” will put a smile on your face. Cohen also does a few instrumentals that showcase his guitar work, too – the traditional Irish medley “Blarney Pilgrim/Jig McCoy,” John Loudermilk’s “Windy and Warm,” and a really nice reading of the Lennon/McCartney standard “Blackbird.” Cohen’s fine picking skills and his warm vocals make Road Be Kind a delightful listening experience. It’s an entertaining journey through classic American and European musical styles that sometimes reach beyond the blues, but never leave them completely behind. Andy Cohen is a remarkable performer who i am most familiar with from his blues playing, but as Earwig's Michael Frank observes, "he never ceases to impress me with encyclopedic knowledge and ability to play at a high level, Traditional blues, folk and true Americana music …" On two days in August and September 2014, he recorded 25 songs from which Michael Frank chose 16 for Cohen's new Earwig album, "Road Be Kind." As Cohen notes in the booklet, roughly half of the music is contemporary which was out of character from the blues and related traditional material he performs. Some of the material was in tribute to folks he has known, like Luke Baldwin, Utah Phillips, Pegleg Sam and Bill Hinkley, whom have passed on. The opening "Five and Ten Cent Blues," one of his originals with his nimble accompaniment and natural, slightly raspy singing, evokes sixties recordings from Bob Dylan, Ramblin' Jack Elliot, Steve Goodman and others. This feel is carried forward in an original by the forgotten Luke Baldwin, "Seldom Seen Slim." Then there is the delightful fingerpicking rendition of Sonny Terry's "Spread the New Around," along with the delightful, "Talkin' Hard Luck," taken from Chris Bouchillion's 1925 recording as well as Pegleg Jackson's version with plenty of delightful guitar and a mix of a rap and talking singing. One can only conjure up in one's mind how an old medicine show performer as Chief Wahoo would try to sell some elixir to this. The title song was written by Scott Alarik and receives a lovely, lilting performance, while John Loudermilk's "Windy and Warm," allows Cohen to showcase his marvelous fingerstyle playing as he adroitly handles its complexity (Cohen notes its a level or two more complex than "Freight Train"). "Mysterious Mose," which Cohen admits he stole from R. Crumb and His Cheap Suit Serenaders, is a delightful hoot that contrasts with his very moving treatment of Utah Phillips' cowboy song "The Goodnight - Loving Trail." Another outstanding blues performance is "Seaboard Train," taken from Larry Johnson's rendition of a song old timey artist Sam McGhee recorded as "Railroad Blues." Cohen plays with a deft touch and invention that might have even made Johnson's mentor, Reverend Gary Davis, smile. "Ten and Nine" is a labor song about women working in the mills, some very young. Its author, Mary Brooksbank," who spent time in prison for labor agitation. It is followed by a lovely medley of Irish songs, "Blarney Pilgrim / Jig McCoy." A lovely instrumental rendition of the Lennon-McCartney penned "Blackbird" provides the coda to this recording. "Road Be Kind" is an fabulous recording from an truly special talent. Andy Cohen is one of those national treasures whom it is all too easy to take for granted and thus to overlook. Growing up in a home with a piano and a lot of Dixieland Jazz records, he was one of many who discovered the blues through the Folk revival of the 1960s. He has spent his adult years playing, studying, teaching, writing about and promoting early 20th century American music, from the acoustic blues of Mississippi, the Piedmont and Memphis, through to gospel and ragtime. He is a virtuoso acoustic guitar player with an encyclopedic knowledge and love of American music and he is blessed with a voice that sounds as old as dirt. Road Be Kind is an all-acoustic solo album primarily focusing on contemporary folk music, with some blues and related traditional material as well. There is the classic instrumental, “Windy and Warm”, Sonny Terry’s “Spread The News Around” and even a raucous version of Walter Weems Doyle’s early 30s “Mysterious Mose”. Cohen combines his own “The Jig McCoy” with the traditional “Blarney Pilgrim”, as well contributing “Fort Sumner Dance”, which he wrote with his friend, Steve Cormier, and “Five and Ten Cent Blues”, a song that he wrote in the mid-1960s and one that beautifully sets the tone for Cohen’s entire life. There is even “Talkin’ Hard Luck,” a hilarious combination of ancient bad luck jokes, puns and witticisms, half-spoken over a ragtime backing. But it is the “contemporary” songs that are the heartbeat of Road Be Kind. The witty and amusing lyrics of Dillon Bustin’s “More Wood” are matched by Cohen’s playful guitar backing. Scott Alarik’s title track allows Cohen to dig deeply into the melancholia behind the ostensibly hopeful lyrics. The album even ends with a version of the Beatles’ “Blackbird”, but the genius of each track on Road Be Kind is in reminding the listener how every “modern” song is really only a heartbeat away from the early classics, originally written and played well over 100 years ago. Cohen is adept at playing a variety of finger styles, in particular when using his thumb to play alternating bass notes a la Rev Gary Davis. It’s an oft over-looked technique both for adding depth to a single acoustic guitar accompaniment but also in creating a drive and a groove to push a song forwards. As an added bonus, Cohen’s album notes for each song are wry, intelligent and educational, and offer an illuminating look into how and why he chose these songs for this album. Road Be Kind is a fine album of acoustic folk-roots-blues. If your tastes extend to the likes Chris Smither or Peter Mulvey, you will find a lot to enjoy here. Helemaal solo nam Andy Cohen deze cd op. Zijn tweede voor Earwig records. Een beroepsmuzikant is hij niet. Misschien nu wel omdat hij de pensioengerechtigde leeftijd heeft bereikt. Hij is een kenner van vooroorlogse blues en folk. Hij speelt akoestische gitaar en zingt daarbij met een aangename, licht gebroken, geleefde stem. Deze cd bevat traditionele folkmuziek. Niet alleen préwar blues of folkblues, maar ook de populaire muziek van die tijd. Ook traditionele Ierse muziek (de medley: ‘Blarney Pilgrim/Jim McCoy), diepgaande Schotse folk van Mary Brooksbank (‘Jute mill song’, door Cohen herdoopt tot ‘Ten and nine’) of hedendaagse songs zoals een instrumentale versie van de Lennon/McCartney-klassieker ‘Blackbird’. Maar daar blijft het niet bij, hij kan ook zeer hilarisch uit de hoek komen zoals in ‘Talkin’ hard luck’ (een parlando-song uit 1925 van Chris Bouchillion met in het tweede gedeelte woorden van Pegleg Sam). Of zoals het door een vriend, Bill Ellis geschreven, ‘John ate the locust and the honey’. Maar ook ‘More Wood’ is erg grappig. Hij omschrijft het zelf als het volkslied voor houtstoof- of openhaard-liefhebbers. Een groot songschrijver is Andy Cohen niet, er staat immers maar één origineel nummer op het album, ‘Five and ten cent blues’. Maar songs omvormen naar zijn hand en oude songs vanonder het stof halen en interpreteren als geen ander, dat doet hij met groot succes. Getuige daarvan is Sonny Terry’s ‘Spread the news around’. Voor wie houdt van traditionele authentieke folk en/of vooroorlogse blues zit met dit album in de zevende hemel. Andy Cohen es un virtuoso del estilo fingerpicking que ha sido descrito en innumerables ocasiones como una enciclopedia viviente del folk, la música country y el blues. Creció tocando el piano de su casa y escuchando muchos discos de dixieland que poseían sus padres pero, a los dieciséis años, quedó atrapado por la música de Big Bill Broonzy y del Reverendo Gary Davis. Este disco que comentamos refleja con fidelidad y determinación los muchos años que Andy ha pasado en la carretera llevando su genuino sonido de canciones folk, blues, country y música ’americana’ a todos aquellos que han querido escucharle detenidamente. Hoy día Andy Cohen es un experto tanto con la guitarra acústica como en su faceta de trovador o de auténtico contador de - historias de la música folklórica americana, lo que queda bien reflejado en este “Road Be Kind” en el que, además de canciones tradicionales del ‘songbook’ clásico, incluye siete temas compuestos por algunos de sus mejores amigos y colegas. MUY BUENO. Andy Cohen is a virtuoso finger-picking style guitar player who has countless times been described as a living encyclopaedia of folk, country and blues music. He grew up playing piano at home and listening to lots of his parents’ Dixieland records but, when he was only sixteen, he became totally impressed by the music of Big Bill Broonzy and Reverend Gary Davis. 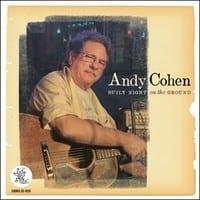 This last album faithfully reflects with great determination the many years Andy has spent on the road carrying his genuine sound in folk songs, blues, country and Americana to all those who wished to listen carefully to his music. 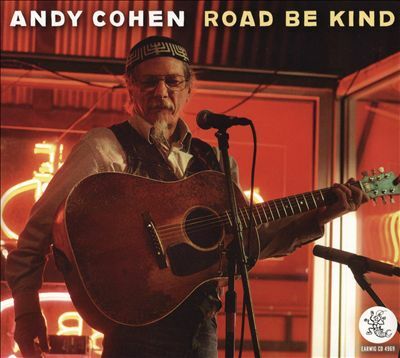 Today Andy Cohen is an expert and an accomplished acoustic guitar player as well as an actual troubadour or a real storyteller of American folk music, which is perfectly reflected in this "Road Be Kind" where, besides a bunch of traditional songbook compositions, he also includes seven tracks coming from some of his best friends and colleagues. VERY GOOD.